It’s a ceremony that few get to see men and women dressed in long white robes singing the song of silence in a temple. Few outside the Parsi community in the city would have noticed it. But just as a 950-year-old Tower of Silence looms over Mumbai’s busy Kemp’s Corner, a Parsi Bawdi towers over a sprawling 14 acre orchard just off Hebbal flyover. The ‘Towers of Silence ’ is where the community conducts the last rites of its dead. The vultures, the carrion that feed off the dead – the Parsi ritual of excarnation – no longer circle above the sacred spot where the Parsis laid out their dead. It’s the fire from the sun and the heat of the earth that reclaim the dead. It’s a ceremony that few get to see men and women dressed in long white robes singing the song of silence in a temple. Around their waist is a silken thread and in the white sanctorum is a flame that burns 365 days of the year. Allowed into this holy place are members of a small community of 800 or so in the city. Though few in number, the 280 Parsi families in Bengaluru preserve the world’s oldest religion, the religion of fire, Zoroastrianism. Parsis have always been regarded with interest in the country owing to their rituals, that remain a mystery to most who can almost never hope to see them. Here lifeless bodies are surrendered to nature and vultures in particular by the community that does not believe in either burial or cremation, seeing them as means of polluting the environment. In Bengaluru, the tower is located in a massive 14 acre campus filled with mango, coconut and other trees overlooking the Hebbal flyover. Despite its massive size it remains inconspicuous and is rarely noticed by the speeding vehicles heading to the Bengaluru airport. While its exact design is a mystery, the tower is believed to be a huge circular well-like structure with a flat roof. Its concentric circles, open to the sun and wind, are where the dead are left to decompose gradually as nature has its way. With vultures no longer descending on the Tower of Silence to feed on the dead, as there are not many left in the city now, the community is forced to depend on the sun alone to decompose bodies and allow the dead to attain salvation. “By custom the dead bodies must be exposed to the sun and vultures, which are allowed to scavenge. 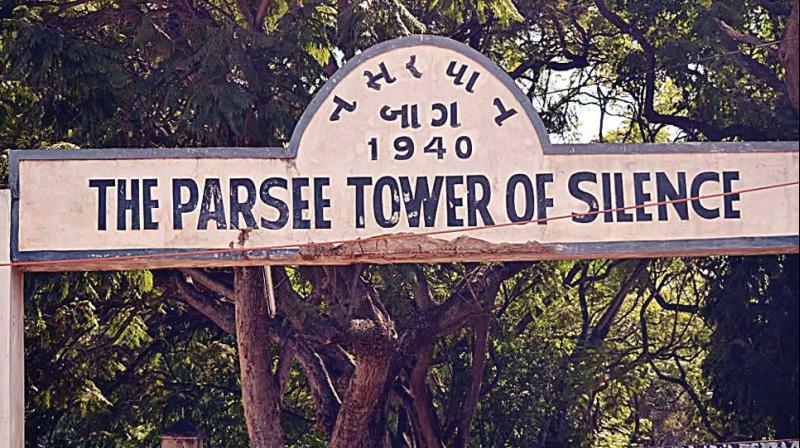 But this has changed over the years as there are hardly any vultures around anymore and they don’t come to the Tower of Silence,” said Mr Shereyar D Vakil,secretary of The Bangalore Parsi Zoroastrian Anjuman. The dwindling number of vultures, be it on the Malabar hill in Mumbai or near the Hebbal flyover in Bengaluru where the tower is located, ,may have robbed the community of a big part of its ritual for the dead, but it has innovated to fill the vacuum. “As the community in Mumbai is much larger and sees more deaths , its Tower of Silence uses solar panels to hasten the decomposition process in the absence of vultures. However, we are a small group in Bengaluru and as there are not as many deaths here, the Tower of Silence is hardly used, the last time being five months ago. So we don’t need to install solar panels. The bodies are just exposed to the sun,” said Dastur (priest) Fardoon. With the vultures gone, its the rays of the sun that help the dead find redemption, he explains. “When we die, we give our body to nature as charity. We do not believe in burial as it pollutes the earth,” said Mr Vakil. The departed souls are later remembered in a ceremony called Muktad conducted by a priest. A group of fire worshippers assemble at the Parsi Fire Temple, oblivious to the traffic on Queens Road, to conduct the 10-day ceremony. The priest takes the names of those who have passed away and those assembled observe silence and pray. Despite its roots in Iran, the community has Indianised in many ways since migrating to Sanjan in Gujarat. But it has never forgotten what gives it its unique identity: its culture, which has much to offer and also its distinctive funeral rituals involving homage to the sun and vultures that have intrigued the world for hundreds of years.